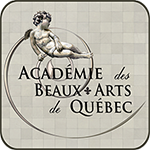 Founded in 2008, the Académie des beaux-arts de Québec is a private fine art educational institute unique to Quebec City. Our mission being to teach the principles of classical academic figurative art, we offer drawing classes in graphite pencil and dry pastels as well as traditional oil painting techniques. Specializing in portraiture, the teachers of the Academy are passionate figurative artists who are committed to sharing their knowledge of the fine arts. We offer courses for adults, teenagers and children. The classes are held mainly in the evening or during the weekend and are limited to a maximum of 6 students to ensure top quality, one on one education. The training program is divided into 10 levels to allow for progressive learning. The academic year is divided into three semesters (Fall - Winter - Spring). Note that it is possible to join a training session at any time during the year. Learn how to draw and paint at your own pace using the classical rules of art. For us to establish which training level is best suited for you, we require that you first contact us to make an appointment for a preliminary interview before enrolling. Copyright © 2019 ACBAQC. All rights reserved.